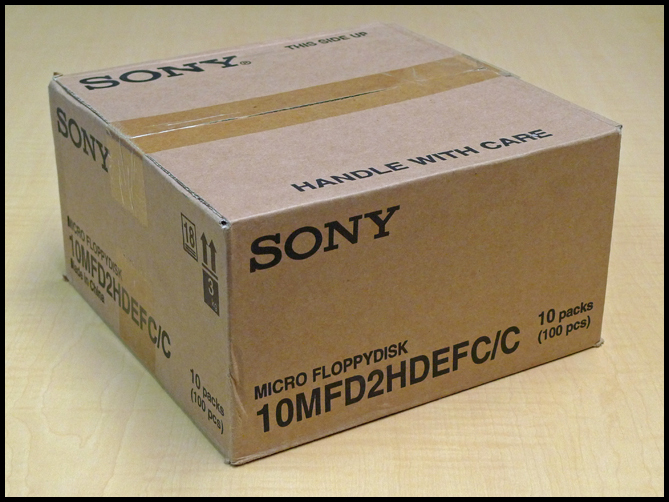 I just found a large quantity of brand new Sony 3.5" floppy disks that has been sitting in our warehouse for *cough* quite some time. They were ordered for a bank related project that was cancelled in the early 2000s. Would anybody be interested in buying new disks for $80 per box of 100? I can post pictures and part numbers if there is any interest. 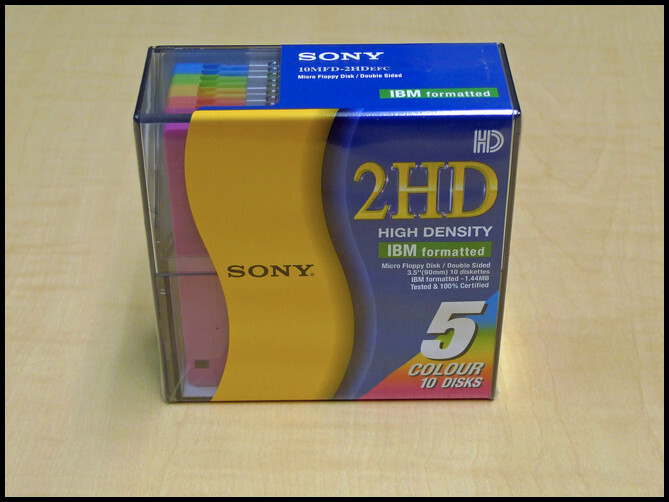 They're standard 1.44MB HD disks in transparent neon shells (packaged in boxes of ten, with five different colours per box). Yeah, that would be useful. Out of curiosity, how many have you got? if only they were 3.5" DSDD instead..
Gibsaw wrote: Yeah, that would be useful. Out of curiosity, how many have you got? By the look of it, there are several hundred disks - all are brand new and sealed. I'll post some more details tonight. cjr wrote: if only they were 3.5" DSDD instead..
Hah. They're definitely all DSHD. You'd probably ok reformatting them to DSDD, but how well they last would depend on the target system and drives. That's not a bad price at all. These are really good quality floppies, very similar to the Imation ones of the era. Very new by floppy disk standards. And they work sweet formatted DSDD, been using them for a while on my A1200. One small correction to my earlier post. I opened up a box and they actually have opaque coloured shells - not transparent. Well, I'll be quite happy to take a couple of boxes, but I don't want to take 200 of them if someone else will miss out. I'll send you a PM with my details. Gibsaw wrote: Well, I'll be quite happy to take a couple of boxes, but I don't want to take 200 of them if someone else will miss out. I'll send you a PM with my details. I don't think anybody else will miss out. There are quite a few in the warehouse. Shoot me a PM and I'll get them sent out tomorrow. Does anyone else want a box of 100 disks? If there's no interest, I'm going to ship them to a dealer in the USA. No takers? How many do you have left? I think Carcenomy should seriously consider buying them all. That's way cheaper than the price of ceiling panels/tiles and would complement his walls nicely. How could the wife not approve that? Going just a smidge further, computer cases all around the exterior, et voila, you have a tourist attraction way better than that silly glass bottle house. Gibsaw wrote: No takers? How many do you have left? I had close to an entire pallet of them - approximately 4,000 disks. But they're all gone now. A dealer in the USA has taken them all.